For the Christmas edition of Works-for-Me Wednesday, I thought I would share a simple yet elegant appetizer for all of those holiday get-togethers. Heat oven to 350Ëš. Cut cheese round in half to form 2 circles; remove wax. Separate dough into 4 rectangles; firmly press perforations to seal. Press each into a 6×6-inch rectangle. Place 2 rectangles, 3 inches apart, on ungreased cookie sheet. Place 1 cheese circle on center of each rectangle (from experience, I would take a knife and “break-up” the cheese; it will heat through better). If desired, use canape cutter or paring knife to cut 2 to 3 small decorative shapes from the corners of each remaining rectangle; set shapes aside. Place 1 remaining rectangle on top of each cheese round. 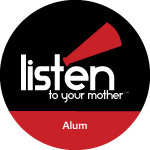 Press dough around cheese to seal; curl bottom edges over top edges, gently stretching dough to form a ring of dough around cheese, sealing completely. Place decorative shapes on top of each pastry. Brush with beaten egg. Bake at 350Ëš for 18 to 22 minutes or until golden brown. Cool 10 minutes before serving. Place on a decorative plate or platter, surrounded by fancy crackers and topped with red pepper jelly. 8 servings. Technically, you could omit the red pepper jelly. To me, however, it is the highlight. Once we were invited to a Christmas party where I brought this appetizer. 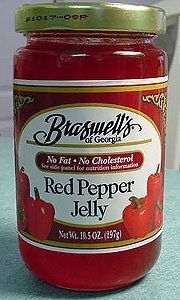 I didn’t have any red pepper jelly and asked my husband to please pick some up on his way there from work. He ended up being very late because he had so much trouble finding a store that stocked it. He finally found it at Publix. Our hostess later gave me 3 jars as a Christmas gift. I will be making this on Friday night; if I remember, I’ll take a picture and update the post with it. 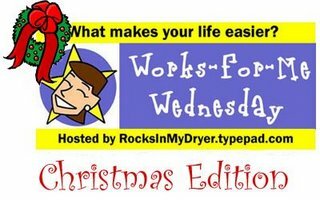 For more Christmas Works-for-Me Wednesday ideas, visit Shannon at Rocks in My Dryer. Yum. We love pepper jelly over cream cheese with crackers. The green is pretty too.